As we know, marine life can be somewhat unpredictable. For this reason it is easy for us to misinterpret our interactions with them. A team of marine photographers learns this first hand. The team was in the Sea of Cortez to film squid feeding behavior. After a night of successful filming, the team returns to the dive boat and noticed that one of their team members, Alex, hadn’t surfaced yet. Eventually Alex surfaced stunned and out of his mind. After he was able to pull himself together he was able to explain what happened. He explained how what he initially thought was a playful squid turned out not to to be not quite so playful at all. 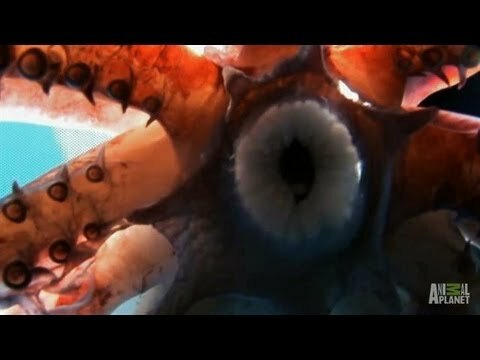 In fact, he found himself being attacked by a number of squid that eventually pulled him under to a depths of 135-140 ft before he realized what was happening and began to fight back and free himself. Watch how this situation played out in the following video. Humboldt are large carnivorous marine invertebrates that travel in groups of up to 1200 or so. They travel at speeds of up to 24 km/hr ( 15mph) projecting themselves via a stream of ejected water. Read below for more detail about the temperament of these animals in the excerpt below. Although Humboldt squid have a reputation of being aggressive, some disagreement exists on this subject. Recent research suggests they are only aggressive while feeding; at other times, they are quite passive. Their behavior while feeding often extends to cannibalism and they have been seen to readily attack injured or vulnerable squid of their own shoal. A quarter of squid stomachs analyzed contained remains of other squid. This behavior may account for a large proportion of their rapid growth. Some scientists claim the only reports of aggression towards humans have occurred when reflective diving gear or flashing lights have been present as a provocation. Roger Uzun, a veteran scuba diver and amateur underwater videographer who swam with a swarm of the animals for about 20 minutes, said they seemed to be more curious than aggressive. In circumstances where these animals are not feeding or being hunted, they exhibit curious and intelligent behavior. They are probably at least as intelligent as the octopus,  which in turn has been shown to have comparable cognitive capacity to that of a dog. With a nickname like Diablo Rojo, you know the Humboldt squid is an animal NOT to be messed with.